One of Middleborough's holiday traditions for over a hundred years (1864-1966) was Christmas candy from B. F. Tripp's, later known as Tripp's Candy Kitchen. While it competed locally in the candy business with other notable makers such as Pasztor & Klar at Middleborough Center and Lucy Braley's Candy Kitchen at South Middleborough, Tripp's was the longest-lived and the most fondly recalled of Middleborough's candy makers. Noted for its "Molasses Kisses" and "Nemasket Chocolates", Tripp's (which operated a store on Center Street near the Middleborough Savings Bank Building as well as a second shop in Brockton), also produced hand-pulled candy, particularly at Christmas when hard, sugary candy canes and ribbon candy were in great demand. While most people today recall the latter item as the frequently sticky and easily shattered candy from our grandmother's candy dish, with its satin-like gloss and colorful stripes ribbon candy was enormously popular as a gift item. (One indication of this popularity locally is the fact that in the week immediately preceding Christmas 1914, Tripp's sold over half a ton of ribbon candy). 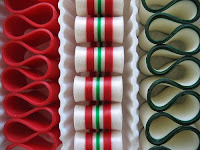 Click on the above photo of the ribbon candy to see how ribbon candy would have been made by Tripp's. (Courtesy Oliver's Candies, Batavia, NY). "Ribbons", photograph by Yvette Jorgens, republished under a Creative Commons license. Some rights reserved. 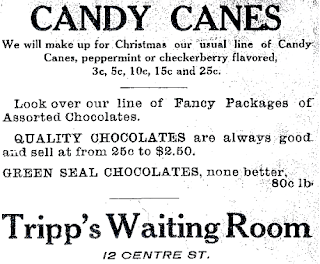 "Candy Canes", Tripp's Waiting Room, Middleborough, MA, advertisement, Middleboro Gazette, December 19, 1913.